Vila de Prado, in the municipality of Vila Verde, will host the ICF Canoe Marathon World Championships, from 3 to 9 of September. Yesterday, the press conference of presentation of the competition allowed to reveal that about 1.000 canoeists of 50 countries will compete in the beautiful River Beach of Faial. 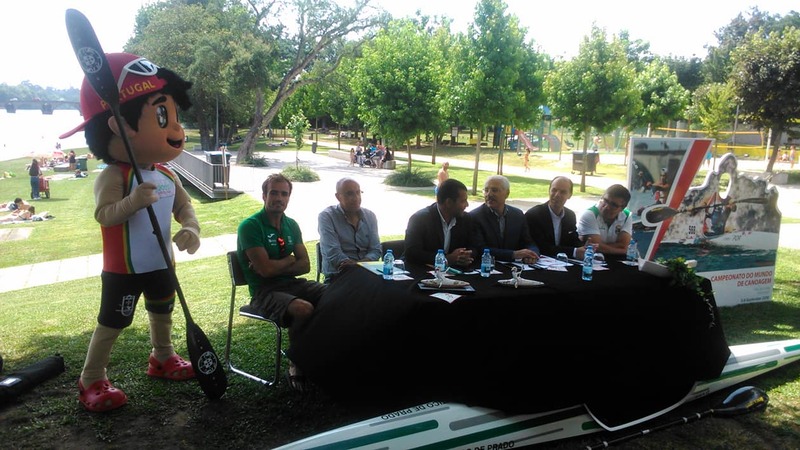 "In 2018, Portugal is the canoeing capital of the world", said Vítor Félix, with the president of the Portuguese Canoeing Federation referring to the ICF Canoe Sprint & Paracanoe World Championships, in Montemor-o-Velho, and Marathon, our Portugal receive between August and September. After assuming that national canoeing now has “two brands”, the federative leader revealed them: "The sports results and organizational capacity of major events". The “trust” of the international entities in Portuguese Canoeing Federation is a demonstration of national quality. Vítor Félix then praised the importance of the Nautical Club of Prado and the municipality of Vila Verde for the organization of the ICF Canoe Marathon World Championships. "It will be the best Marathon World Championship”, said the president of the Portuguese Canoeing Federation, who wanted to "combine a good organization with good sports results". "Our bench is very high and always aims to fight for medals”, said. Six times european champion in K1, José Ramalho took the will to "get 100% to the competition" before revealing that the team portuguese "hopes to get medals". "I want it to be the gold, but it does not depend on me alone”, recalled the Vila do Conde canoist, who soon tried to reinforce: "It will be a very hard test”. The european champion said he expected "a large influx of people", appealing for the support of the portuguese people to be "decisive" in order to achieve "good results". The mayor of Vila Verde assumed that the Marathon World Championship in Vila de Prado will allow "the projection of our land around the world", with António Vilela to reinforce that "all the wills are joined" to achieve success absolute. "We have great hope in this event, which will serve to affirm our county and canoeing. We hope that the portuguese athletes will achieve great results here”, said. President of the Nautical Club of Prado, Horácio Lima hoped that "everything goes for the best", conveying that all those involved in the organization "will give everything to make this event in the memory of all who come to participate". "We will have a great Marathon World Championship", said. City councilor of the Sport of the municipality of Vila Verde, Patrício Araújo said that the organization of the Marathon World Championship represents an investment of “300 thousand euros” and corresponds to the “highest level of world canoeing”. "We have a heart full of enthusiasm," said. Albano Bastos, president of the Town Council of Vila de Prado, highlighted "the good conditions for canoeing" in the village.